After arriving in 2006 from Wolves, Lee Naylor made a good start to life at Celtic, looking like the answer to long-term left-back problems. Nominated for players’ player of the year in his first season, unfortunately it was downhill from that point on. Though sometimes unfairly made the scapegoat, the criticism was never without substance. A decent full-back but not a modern one, he wasn’t in-keeping with Neil Lennon’s revolution. Lennon’s description of Cha Du-Ri as a “modern fullback” illustrate what a full-back needs in today’s game: pace, power, athleticism, high stamina levels and an ability to contribute in attack – these are things that Lee Naylor doesn’t possess. He was released without much fanfare but with best wishes for a new start at Cardiff City. A player who was largely over looked by Martin O’Neill – possibly because he was used at left-back – but went on to become a mainstay at centre-back under Gordon Strachan. A great attitude lead to him being named captain but this perhaps was too soon, and may have had an adverse affect on his performances. His weaknesses are well documented with him lacking pace and physical dominance but he reads the game well, often making last-ditch blocks or tackles. Technically, he left in January when sent on loan to Middlesbrough, but there were rumours of a return to the Hoops before he re-joined his old boss permanently. His signing came as a surprise, arriving on the last day of the Summer 2009 transfer window and his season at Celtic wasn’t much different. After a promising start against Rangers and a couple of other appearances he went on to become a bit-part utility player and so never made enough of an impression to be missed. Like Naylor, his departure didn’t draw much attention. Very little was seen of Koki Mizuno and so like Zheng Zhi never made enough of an impression to be missed. His signing was only ever seen as cheap gamble, with little gained nor lost from his time at the club. ‘The Holy Goalie’ can be put down as one of the biggest successes of the Gordon Strachan era. Signed for little with not much known about him, he made the the number one jersey his own, solving a long term problem position and became a fan favourite in the process. An imposing presence, he often saved his best performances for big occasions such as the Champions League, peaking at the 2008 European Championships. In recent times he didn’t quite match his early levels but was still able to produce spectacular saves and it remains to be seen whether Celtic will be able to replace him. His new start at Fiorentina will no doubt be followed with interest. These two have joined Swindon after what can only be considered as failing to make the grade at Celtic. Neither made much of an impression on the first team though Caddis at one point looked like he might be in with a chance. The move is probably best for their careers and they go with best wishes for the future. When the former Gaelic football player first broke onto the scene in a 2007 cup-tie against ICT, he looked a good prospect. 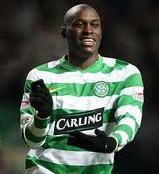 Decent pace and freakishly tall he looked like he could go on to be a real handful for SPL defences. After a brief spell in the first team due to injuries in 2008, where he scored 4 goals, little was seen of him in the first team. He now makes an interesting and exciting move to CSKA Sofia, where he has already opened his goalscoring account. Little needs to be said about Aiden McGeady that hasn’t already been by others, his talent being there for all to see – the most gifted player to come out of Scotland for quite some time. His best season was the 2007/2008 season, when he looked like one of the most exciting young attacking midfielders in Europe and his best performance probably coming against Benfica in the Champions League (hence the picture). There were criticisms too, such as his lack of end product but these were largely exaggerated. This was particularly the case after the departure of Shunsuke Nakamura which left him with too much creative responsibility, and in turn lead to Celtic’s attack becoming quite predictable. 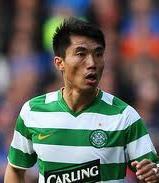 His move to Spartak Moscow is good for all concerned as it started to look like the SPL was holding him back. He’s another who will have followers keen to see how far he can go, which is a long way if he fulfils his potential. Fortune is one to put under the ‘What Might Have Been’ category. He arrived with the description of being a forward who doesn’t score a lot of goals but brings others into play and he fulfilled this to an extent. Part of the problem during most of his time at the club was the lack of other players around him who compliment his style of play. Celtic’s best spell last season was when fielding a midfield of Robson, Crosas, N’Guemo and McGeady and a front-line of Fortune and Samaras in what was described as a 4-4-2. However, the natural game of each these players meant the attacking shape was often a 4-2-3-1, with Fortune leading the line and numerous chances created by his clever movement and hold-up play. Unfortunately, that Celtic side were exactly clinical in front of goal (to say the least) and the potential of the system was never fulfilled. That said, Fortune’s price-tag justified the need for more goals from him and with one trophy-less season his time at the club should ultimately be considered a failure.